First, preheat the oven to 120 degrees celsius. Then roughly cube the tomatoes and chop the red peppers into 2cm pieces, and place those in a small roasting dish, then drizzle in the olive oil, add in the dried thyme and season well with salt and black pepper. Toss everything together then place it in the oven to roast for 40 minutes, shuffling occasionally. In the meantime, quarter the green olives and chop the sun-dried tomatoes. To make the pesto, add all of the ingredients together in a food processor and blend until smooth. After 40 minutes, remove the roasted pepper and tomato from the oven and leave to cool. 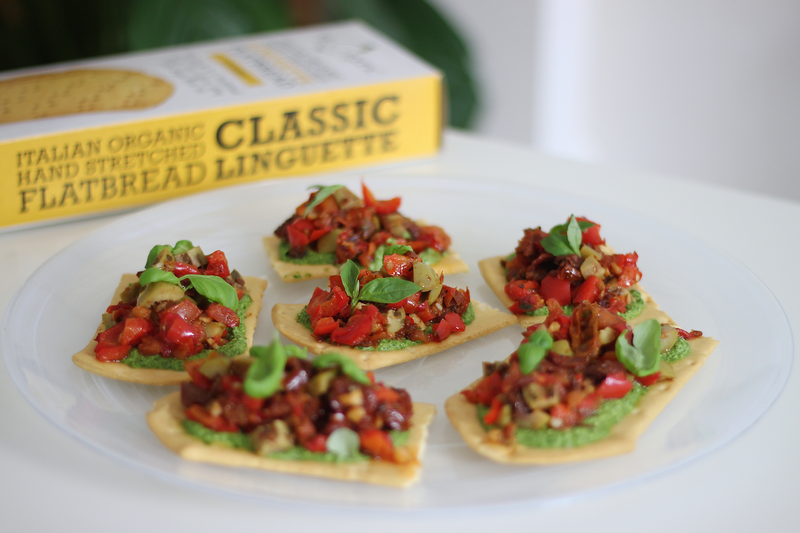 Take one of the Mr Organic Classic Linguette Flatbreads at a time and snap them in half, then spread the pesto onto each one. Add the quartered olives and sun-dried tomatoes into the roasted pepper and tomato, turn it through well and then top each flatbread with the mixture. Finally, tear up the fresh basil leaves and add them on top to garnish. Keep any remaining pesto in an airtight container and store in the fridge for up to 5 days. Store any remaining roasted red pepper, tomato and olive mixture in an airtight container and use within 3 days for maximum freshness.